A 356 is a tiny car by modern standards. At 65.4" wide, a 356 is narrower even than a current Mitsubishi Mirage(65.6"). Most 356 variants are also shorter in terms of height than Project 944 GTS, and around 18" shorter in overall length than my 944. Stretching one to fit over a 987 Cayman then, is no mean feat. West Coast Customs managed to combine both cars into one seamless, functional vehicle in just 8 months. What ultimately emerged after eight months was a pretty incredible car that doesn't entirely resemble either the original 356 base car, or the Cayman which donated its chassis. Some of the more Porsche-nerdy things about this build weren't touched on in the video, so let's look at them in more detail. The 356 donor car appears to be a T5 or T6 car, based on the photos provided of the rusty, decaying base vehicle. The late model 356 features higher headlights and bumpers than the A-model the finished product ultimately emulates. Though the builders say that widening the car provided the biggest challenges, re-contouring the bodywork to match the earlier lighting and bumpers must have been a challenge as well. The bumpers are said to be stock 356 bumpers widened to match the new ~6" wider width. Appropriately for a mid-engined car, most of the added wheelbase is behind the doors. This visually messes with the 356s' proportions more than the added width, though with the work that went in to making the roof profile make sense, the car is still very recognizably a 356. Of course, being Cayman-based, there is nothing under the rear bodywork. Unlike an original 356 this build has two useful trunks. The rear trunk gives access to the oil filler, as well as the coolant expansion tank. The front trunk is solely for storage, as the radiators were hidden cleverly inside the front wheelwells. Fit and finish appears to be very good, with a welcome eye towards practicality not often seen in such wild custom builds. Jay sees a little Hudson Hornet in the wider rear end, I see a little more 1950 Nash, but that is really splitting hairs. 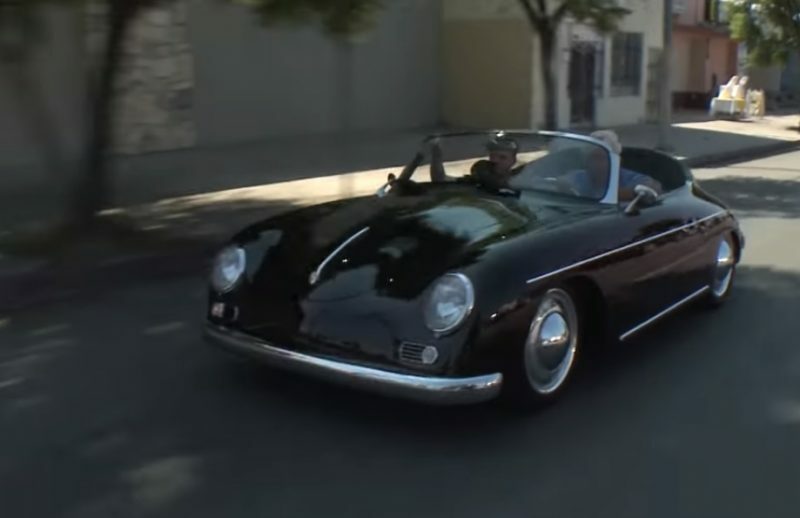 Unlike both donor cars, this 356 is a convertible. The hardtop features three pieces of custom glass, and is removable. Unlike Porsche's own hardtops from the period, this one matches the top profile of the original coupe nearly perfectly. Save for the seam, the only real giveaway is the chrome windshield frame. Much of the interior comes from the Cayman donor car. The dash, center console, instruments and many of the touch-pints are taken almost wholesale from the Cayman. The seat bases look like stock Porsche units, while the backs are custom low-back pieces with less bolstering than the stock Porsche seats. The polished steering wheel is a little much for my taste, I quite like the stock 356 wheel, but it does match the aesthetic better than a modern airbag wheel. 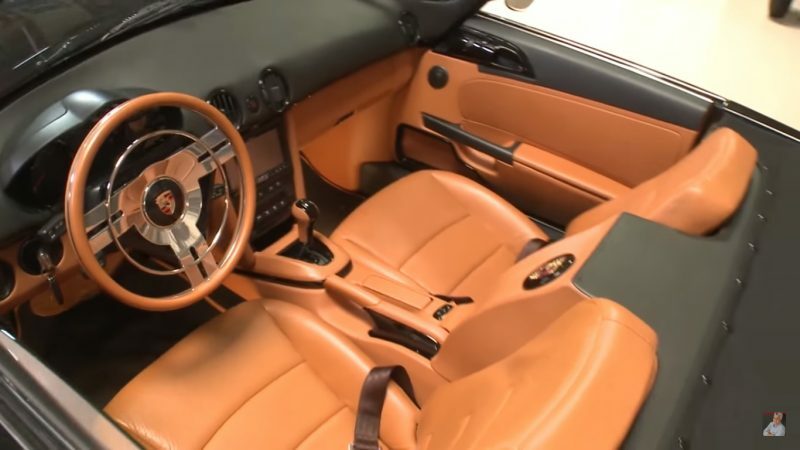 The donor car is said to be an '08 or '09 Cayman, though the shifter looks more like the old 5-speed automatic shifter than a PDK shifter to my eye. Jay asked the all important question- how do the Porsche-faithful like the car? As an admitted 356 fanboy, I quite like it. While we should save as many 356s as possible, not every one is worth saving. The donor car for this project looked like an ideal candidate for something as fresh and creative as this build. I support this build, and hopefully the Porsche community feels the same way. Given the time and expense, I don't see this starting a trend towards rebodying Caymans as 356s, but as a one-off it is just too interesting to ignore. Let us know what you think in the comments! Did we mention that it's for sale? The video lists 356@westcoastcustoms.com as the place for queries about buying this remarkable car. Porsche’s Newest Electric Concept is a Cayman. Capable of 62 MPH in 3.3 Seconds. Could not think of a more desirable one off that saves the best of both worlds, new and old. Extremely classic at first look and it just draws you in with each new angle of view. Knowing how well this shop takes its builds to the max in every aspect I expect the body and subframe to be very safe and up to speck. I just finished a 5100 mile road trip that this particular car would have been very happy to ride over so many states and National Parks that my wife and I had always wanted to see! I am sure it gets more than its share of attention and preforms to the best of the abilities of this merge of cars. I only wonder how to service such a unique vehicle? I’ll let you know when I win the big lottery and be ordering one just like this if this isn’t sold first! Thanks for keeping my mind exercised and entertained with such brilliance! YEAH, what to say more after this?